The more things change in Mary Kay, the more they stay the same. In MK, they always like to tell you that you’re in the “right place at the right time.” This is a way of saying that this is the best time in the company. They’re so cutting edge, they’ve got the greatest products, and here you are! Aren’t you lucky? But the sad truth is that it’s the same old crap, and corporate is just spinning their wheels trying to find a way to repackage the same nonsense in a cool way to make you think it’s something new. NSDs are retiring before their incomes plummet even more. Did you know their retirement earnings are based on their last 5 years of commissions? So if their earnings are falling, they better retire now before things drop off too much. They can say it’s their health or a new season in life, and everyone is good with that. There are only 9 NSDs on target for Inner Circle. We usually see 10 to 13. Out of about 13,000 units nationwide, only 25 added 20 or more new consultants in September. Applause recognizes the Top 100 units for retail production (really, wholesale orders x 2 = pretend retail sales). The unit at the bottom of that list didn’t even do Cadillac production. At the bottom was Mary Howell with $33,851. Divide that by 2, and you get wholesale production of $16,925. Cadillac production is $17,000 per month (although it’s technically $102,000 done over a period of 6 months). And that’s the top 100 units in the division!!!! The magazine shows the Top 100 director commission checks, and the last one on that list was Patty Bojan with $5,932. You better believe all those ladies on that list are bragging about their executive income, but less than $6,000 certainly isn’t anywhere near executive, especially when you figure all the business expenses that have to be paid out of that check. And once again, we have a NEW Mary Kay starter kit!!!! How many times have we heard that???? What Did the $50 Starter Kit Really Get You? “People will lie, but the numbers don’t.” Isn’t that what we were taught? Truer than ever! 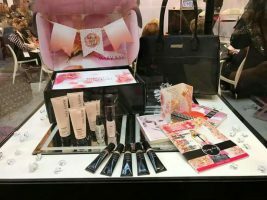 Mary Kay got “built” as a company because women were kept in the dark about what the real numbers and real results were. In the 60’s and 70’s home party selling was a thing. From then on it was in slow decline, as well as more and more info was getting out about product based pyramids. But even in the 80’s 90’s and early 2000, they could keep their lies, schemes, false claims and lies of omission under wraps because of the “never be negative” rule. Then, INTERNET. Since 2006, PT and others have been serving as a platform for those who got sucked in, bee-lieved, and lost themselves in pink indoctrination and cult think. Finally able to tell the truths of MLM, and expose how it is done, new recruit targets get the benefit of those who fell for it, and step away before their finances are destroyed. If this hurts these manipulating pink predators bottom line, then YAY. For the thousands upon thousands of on targets, DIQ’s and Director’s out there who went tens of thousands of dollars into debt chasing “the dream”, look at your National and Corporate and Mrs.’s Ash’s heirs because their lies and elaborate manipulation have stolen your wealth, and for some, their financial future. The tippy top NSD’s will jump ship as soon as they can with their family security program thanking them, for 15 years! !– just for lying to you! None of that is true. Mary Kay isn’t a pyramid nor do people who get started in it have to go into debt. Being a member of this business is about network and making women feel good about themselves. If you decide to start, you are not required to do anything you don’t want to. You don’t have to spend any money on it at all, you can do as little or as much as you want to. There is no quota of having to have thousands of dollars in inventory, anyone who tells you that has no idea what they are doing. While it helps to have inventory, it is NOT required by the company, unlike many of MLM companies like LuLaroe and such who require ridiculous amounts of money to be invested. With Mary Kay, you invest what you want to and what you can. There is no required monthly selling, while there are perks if you do sell a certain amount, you are not treated negatively or frowned upon. This business is meant for women to choose their own path based on what they want. Actually, everything she said IS true. Mary Kay is not a business. It’s a pyramid scheme. It is built on deceiving women in the recruiting process so they sign up and spend a bunch of money, even though they have almost no chance of turning a profit. And you’re right: Mary Kay doesn’t require inventory or monthly selling. However, there is a great deal of pressure to order inventory, and in order to get products at wholesale cost, a minimum amount must be purchased each quarter. Does this Applause show anything about Dawn Barton’s unit? I noticed the other day her website has removed all the Mary Kay links and she’s now rebranding herself as a joyologist? The issue is linked so you can take a look. It is Ruby area directors, though, so I don’t know where she falls. Tracy, thank you! I was reading too early in the morning to catch that. She was in Kathy Helou’s area, and she now says she’s a “former” Million Dollar Director. That has to sting! What in the name of Kingdom come is a joyologist? It reminds me of the diddy that you heard in the running man movie from the 80’s. “We bring you love, we bring you joy” – and if you keep your credit card out we’ll bring you debt as well. Someone said she was terminated for her book and other reasons. And that is the point no one still in MK will even think about. The vast majority are nowhere close. I’ve been seeing more and more of this. They modify their websites to only obliquely reference Mary Kay. I think it’s just a back-door into the MK flopportunity. Most of the MLMs encourage the distributors to NOT mention the name of the company until the potential recruit speaks with them personally. They don’t want them researching independently because they might find Dream Stealers like us. Better to start the brainwashing personally and tell them how they are not like All The Other companies they’ll find and all the Untrue Websites on the internet that say Untrue Things are full of Meanies Who Lie. Right…and I bet the “Free journey” starts with a skin-care class. Yeah, they better like SMALL wins (or more likely, none at all) because only the person at the top of the pyramid is going to be getting the big wins. We have a new term! “Cupcakes and Clapping.” Think about this. A woman was motivated by a $1 cupcake and attention to spend thousands of dollars and most likely went into debt. Ladies, if you are in need of attention, find a way to get it in an authentic way that doesn’t cost you anything more than your time and/or donations. For instance, if you volunteer in an after school program, I can guarantee that you’ll get hugs and attention from children. If you volunteer with animals, you’ll get licks and barks. Garbage in.. garbage out.. it is with Mary Kay. Since Tracy got me sucked in the LuLaRoe rabbit hole by posting about it here on PT, I thought I would share the latest drama. Consultants are fuming! The top of the pyramid will no longer get paid by wholesale recruits, only by sales through their messed up system where chargebacks can’t be done. Now sponsors and mentors are crying saying why should I recruit and spend my times training, I went from $7k a month to $350 in bonuses. 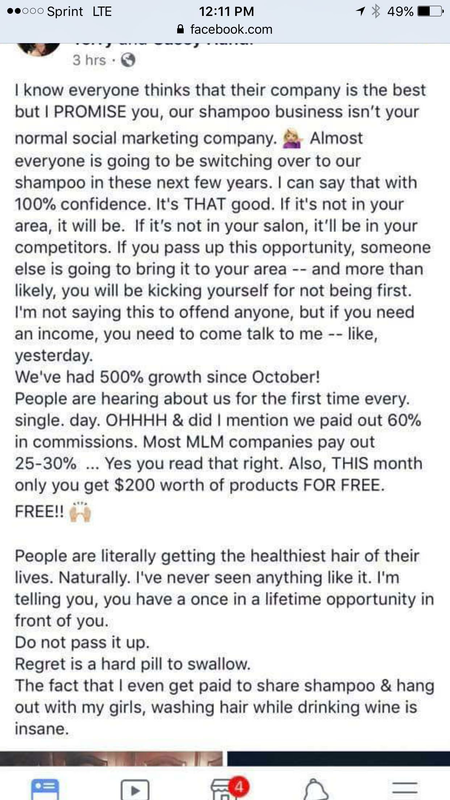 Newest MLM alert: Shampoo that makes your hair fall out. Check out this gem. Correction: bonuses will only be paid by retail sales and that is IF the customer uses LLR system and not PayPal to pay the consultant. I think they’ve started this because of all the lawsuits being accused of being a pyramid scheme. 500% growth in the company, you say? Well I suppose if 10 people sold it before and 60 people sell it now, that is technically 500% growth in the number of sales people. I see this crap all the time on Facebook and it’s sickening. No. I don’t want to join your MLM. I use Paul Mitchel and Pantene. I don’t have to pay the company a fee just to buy and recruit others. Tracy, there are fricking SCRAPBOOKING MLM. What’s next? Baby clothes? you know, I have been researching some of the “old” unitnet sites I used to frequent. One of the tippy top sales directors in the Nat’l area I used to belong to no longer has her unitnet site. I wonder what is up? Could it be that site rental is too much for the tippy top? A lot of directors are either going to standalone websites instead of unitnet because unitnet is so ugly and outdated OR they are just ditching websites in favor of Facebook since it’s free and easy. Unitnet. It was so cheesy! Also remember that this issue reflects September 2017, which is the last month of a quarter, where there is always the biggest push. You can expect the Oct and Nov numbers to be even worse. Pure exactly right! Quarters ending always brings production. And holiday products, too! Apparently the software is set to strip out the code for inserting images inline and links is the best we can do. Which keeps the replies from being inundated with memes and dikpix from people we’ve stolen dreams from.